It’s been a busy weekend for our Ranby House Friday night boarders, which started with a high-energy game of Man Hunt with Mr Harper. The pupils then settled in to start their evening of discovery through STEM (science, technology, engineering, and mathematics). Our guest speakers, Mr Watt (Head of Physics) and Mr Henshaw (Physics Teacher) visited us from Queen Elizabeth's High School, Gainsborough. The 24 pupils from Years 2 - 6 were divided into four groups, Year 6 pupils were paired with a Year 2 pupil to help mentor them through the evening. 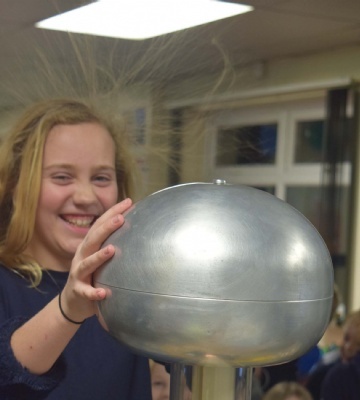 It was a hair-raising start, with a demonstration of the Van der Graaff generator. Each group then had the opportunity to take part in four activities, making ice cream, slime and hydrogen gas, as well as looking at Daphnia’s under a microscope. The fun did not end there, as the night finished with a finale of dragon’s breath spontaneous combustion, laser eye model and elephant’s toothpaste.